Imagine enjoying a lively BBQ party with your loved ones on a pontoon boat during a sunny summer’s day, or better yet firing up one of your catches after a long day of fishing as you watch the sunset in the horizon. If that sounds like an ideal day for you, then it’s probably a good idea that you invest in a good quality BBQ grill for your boat. To help you make an informed purchase, we’ve put together a helpful guide that includes info on what to look for in a grill, whether or not it is legal to have one, as well as a review section on a few grills that we think are the best options available right now. But first, let’s take care of the pressing questions, shall we? The answer is, yes. Absolutely! It is 100% legal to BBQ on your boat, so long as you observe the right safety precautions. For starters, it’s important to not place the stove around any of the machinery that’s on your boat. Instead, put it on an isolated yet open area, where you’ll be able to easily access it while making sure that it’s safe and well-secured. Whatever you do, keep it away from the engine, bilge, and enclosed spaces. The good news is that these days you can get purpose-built marine BBQ grills which are constructed in a way that makes them safe for use on a boat. Most of them feature bracket sets which you can use to mount the stovel safely onto the boat rails. Once you’ve purchased the stove, you might decide to host a BBQ party for your friends and family. If that’s the case, make sure to keep things courteous, and try not to annoy anyone with too much noise, smoke, and rowdy behavior, as that may lead to trouble with the local authorities. Also, check the safety codes and regulations of your marina before you fire up your stove, because stove use may not be allowed in your state for specific reasons, but you can’t know that until you do your research. But, the last thing you want is to cut your BBQ party short just because you didn’t comply with the rules and regulations of your marina. It could be as simple as getting a permit or giving them a heads up before you start the grill, so definitely try to not miss this step. It’s also important to note here that some states prohibit boat owners from catching and cooking fish on their boats, while other states do allow it, but on condition that the fish is a certain size and weight. Again, do your research and find out what the rules and regulations are in your state and your marina. As with any purchase, you’ll have better luck making a good choice when you know what to look for. Aside from your own personal preferences, the following features are what you should look out for when you’re shopping for a grill for a pontoon boat. When it comes to pontoon boat grills, size is important. Thing is, you want your grill to fit nicely into your boat without taking up too much space. Also, it must be large enough for you to cook your food comfortably and in enough batches. A good tip would be to first figure out where you’ll be placing the grill, and perhaps even measure that space so that you know how much grill your boat can handle. Pontoon boat grills come in different designs. There’s the permanently mounted variety, which as the name implies, can be permanently mounted onto your boat which makes them quite secure. Then, you have portable stoves that can be removed for use both on the boat and on land. These are usually attached to the boat railing using a mounting kit, and are actually quite convenient when it comes to cleaning and maintenance. Make sure that the pontoon grill you purchase comes with a warranty. This will come in handy if the stove doesn’t perform as expected, or if a part of it breaks, which can happen with any grill, to be honest. Then there’s the issue of rust, which is an inevitable consequence of using a grill close to the water. You also need to decide on whether you’ll be buying charcoal or a gas grill. Gas is obviously easier to work with regardless of the weather conditions, whereas you can’t really say the same of charcoal grills. However, charcoal does add a distinctive flavor to the food, which is something that you want to consider if that’s important to you. Just keep in mind that if you get a gas pontoon grill, you might have to get an additional two propane tanks to handle catering for multiple people over an extended period of time. Boat grills also come in two different shapes, namely circular and rectangular. Rectangular grills usually have a larger cooking surface that allows you to cook more food and cater to more people easily. A circular grill, on the other hand, is much more compact and may not be able to accommodate as much food at once as a rectangular grill, but it’s lightweight and versatile enough to use on the boat and on land. So the grill shape that you choose will mostly depend on your preferences and needs. It’s also important to pick a pontoon grill that’s made from sturdy, rust-resistant and low maintenance materials. That’s because you’ll be using the boat in different weather conditions and that can take its toll on any product. The one material that really ticks all the boxes is stainless steel. If you’re looking for a rugged stove that has a lot of surface space for cooking, then the Extreme Marine products Cuisinart Grill might just do it. It has 145 square inches of cooking space and comes with pre-installed brackets for easy mounting. And the brackets are actually designed specifically to fit into the pontoon boat rails. This stove is also portable which means that you can use it on and off the boat, plus it’s pretty lightweight at just 18 pounds. The solid propane tank mount is built tough to make sure that it doesn’t slip, and you’ll have 3 colors to choose from when purchasing this BBQ including red, silver and black. This pontoon grill is a very well-built stove from Coleman Classic and it features two separate adjustable burners and wind block panels on the sides to prevent flare-ups. It’s an old-school design to be sure, but one that is durable and so long-lasting, that some people have had this for over two decades and can still pass it onto their children because it’s still going strong. Also, the design allows you to control the heat better and distributes it efficiently while keeping your food protected as you prepare it in different weather conditions. It’s constructed with aluminized steel, with a chrome plate grate that is durable and removable for easy cleaning. The surface is large enough to fit two 10 to 12-inch pans at the same time, and one 16.04oz propane cylinder can last for up to 1 hour of cooking. 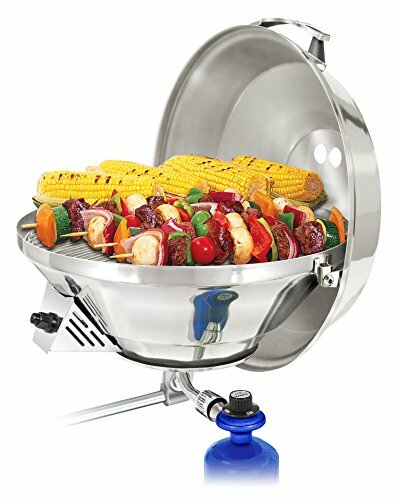 This circular boat grill from Magma is nice and portable and comes with a well-balanced hinged lid and a handle that stays cool throughout the cooking process. Because it’s made from stainless steel and is lightweight, this stove is really easy to clean and low maintenance overall. 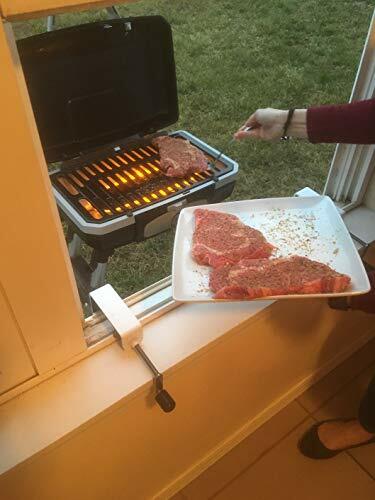 It also handles heat really well and is so energy efficient that it doesn’t use up extra fuel when you turn up the temperature as some other grills do. Because it has a dome-like circular design, this stove distributes the heat really well, which helps to extend the lifespan while preventing flare-ups as well. It also comes in two sizes, a 15” and 17”. 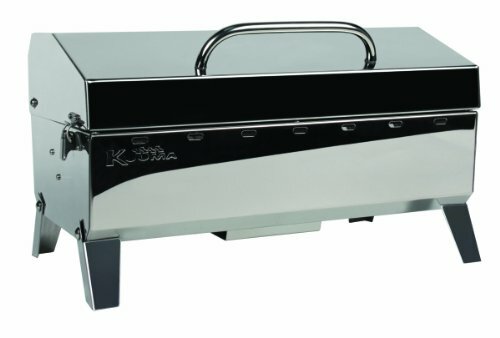 With 160 square inches of cooking surface, this grill is made for comfortable cooking on the go. It’s a rugged appliance that’s made from marine grade stainless steel, and it features a latching lid and a handle that stays cool throughout. The inside of the lid is lined to lengthen its lifespan and prevent discoloration over time, while the foldaway legs make it versatile enough to use on any type of flat surface. However, you can even mount this stove if you like but you’d have to purchase a compatible mount from Kuuma first. It comes fully assembled, so you don’t have to worry about putting it together, and larger models of 216 and 316 square feet are also available if you’ll be using it to cook for larger groups of 10 or more people. The best part is that this pontoon grill it’s backed by a 1-year limited warranty. 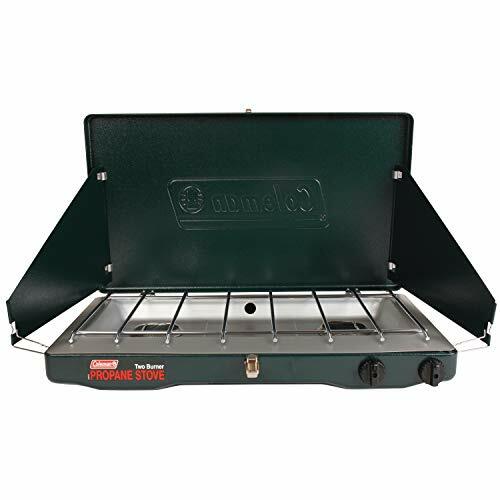 This gas stove from Camco is made to last with solid stainless steel construction, and features 180 square inches of cooking surface, folding feet for portability, and it’s suitable for mounting as well as tabletop placement. 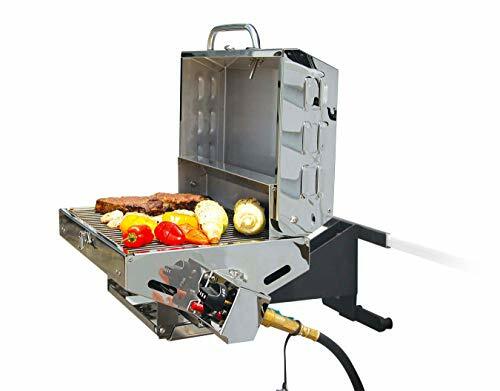 It also comes with a quick-connect propane outlet, a temperature gauge, an easy to use low-pressure control valve and a cast iron smoker plate. There’s also a drip/grease tray that helps to prevent messes and a really efficient Piezo electric spark ignition. Our top pick from the pontoon grills featured above is the Extreme Marine Products Cuisinart, which is not only lightweight but has a lot of cooking space and great heat distribution. We also love the fact that it’s well-made and long lasting enough to handle outdoor cooking without rusting. The only downside is that there has been some complaints about the igniter needing some improvement. If you’re looking for a more budget friendly option, look no further than the Coleman Classic. It’s the most consistent in terms of heat distribution and durability. Plus, it has an easy setup, can block out the wind efficiently, and it’s easy to setup. As a cautionary note, there has been complaints about the controls being a challenge to operate unless you put lube on them. Despite this complaint, overall this stove is an amazing value for the money.